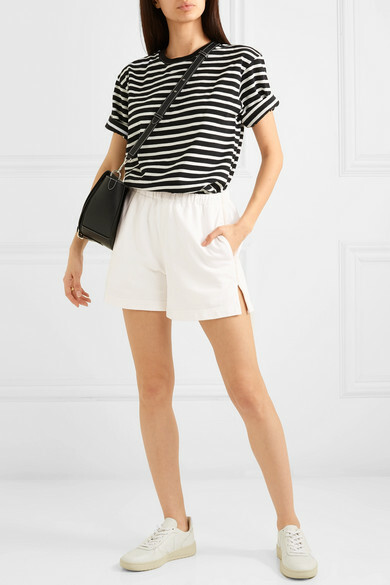 Bassike's shorts are perfect for days spent lounging around home or an early bird catch-up with friends over breakfast. Made from ivory organic cotton-fleece that's been brushed for softness, this slightly loose pair is striped with beige grosgrain at the sides and has a comfy elasticated waistband. Wear them with a T-shirt and sneakers or a plain tank and slides. Shown here with: Bassike T-shirt, JW Anderson Shoulder bag, Veja Sneakers.